I'd already made TaskMagic resources based on this story a while ago. I've merged these into the pdf "fr_cendrillon_text_merged.pdf" below, which contains 10 separate activities based on the story. The text compares two towns. There's only one pdf, but it's made up of 10 separate single-page activities, printed from a TaskMagic3 Mix&Gap file. I've also included this Mix&Gap file (.mtx3), which provides access to about 20 interactive exercises (but requires you to have TaskMagic3). Hope these are useful to somebody. These resources are based on a letter from a penpal in Spanish, suitable for year 10. There's only one pdf, but it contains 14 pages (=14 different activites), mostly based on the text of the letter, with a few based on key vocab from the letter. The resources below are based on a short text featuring all parts of aller in the present tense, along with a few modes of transport, within the context of talking about how you go to school. I've also included the original Mix&Gap (mtx3) and TextMatch (mdl3) files, both of which require TaskMagic3. The images show the variety of activities in each of the TaskMagic3 files. Lots of Spanish resources, suitable for good GCSE groups but also for AS, based on a fairly short text about sweatshops. The pdfs were printed from TaskMagic3 (Mix&Gap and TextMatch) using http://www.dopdf.com , and combined as 2 pdfs with lots of pages using http://foxyutils.com/mergepdf/ - the "text" pdf contains 11 worksheets and the "vocab" pdf contains 5. I've also attached the Mix&Gap file (mtx3, based on the text, with access to about 20 interactive exercises) and the TextMatch file (mdl3, based on the vocab items, with access to over 20 interactive games and exercises) - both of these require TaskMagic3. There are 12 pdf files all based on the same text. The image shows the menu screen in TaskMagic with the 18 interactive exercises represented by a screen thumbnail. See the resources below based on a short text about the humble T-Shirt. 12 x pdf files: 9 based on the text (8 tiles; 15 tiles; 24 tiles; 1in3; gapfill; contextgaps; promptgaps; findspanish; longgaps) and 3 based on the vocab (matching; write; dominoes). 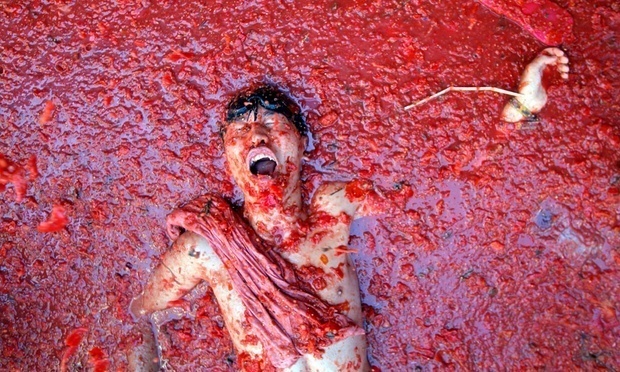 See the resources below based on a short text about Antonio's experience at Buñol's "tomatina" festival. 13 x pdf files: 11 based on the text (8 tiles; 15 tiles; 24 tiles; 1in3; gapfill; spaceinsert; anagrams; contextgaps; grammargaps; findspanish; longgaps) and 2 based on the vocab (matching; dominoes).